Example of 4 year old English Bulldog of champion bloodline, side view. Notice the "rope" over the nose, and pronounced underbite. The Bulldog is a breed with characteristically wide shoulders and a matching head. There are generally thick folds of skin on a Bulldog's brow, followed by round, black, wide-set eyes, a short muzzle with characteristic folds called "rope" above the nose, with hanging skin under the neck, drooping lips, and pointed teeth. The coat is short, flat and sleek, with colors of red, fawn, white, brindle (mixed colors, often in waves or irregular stripes), and piebald. Despite their famous "sourpuss" expression, Bulldogs are generally docile and easy to please. They can move quickly over short distances. Bulldogs do not need a lot of physical exercise, so they are well-suited for living in apartments and other urban environments. They are friendly and gregarious, but occasionally willful and well trained if training is done right. The phrase "stubborn as a Bulldog" is loosely rooted in fact. They rank 78th out of 80 in Stanley Coren's The Intelligence of Dogs, being of lowest degree working/obedience intelligence. Other problems can include cherry eye, a protrusion of the inner eyelid (which can be corrected by a veterinarian), certain allergies, and hip issues in older Bulldogs. Puppies are frequently delivered by Cesarean section because their characteristically large heads can become lodged in the mother's birth canal during natural birth. However, it is not entirely uncommon for a Bulldog to whelp naturally and successfully. 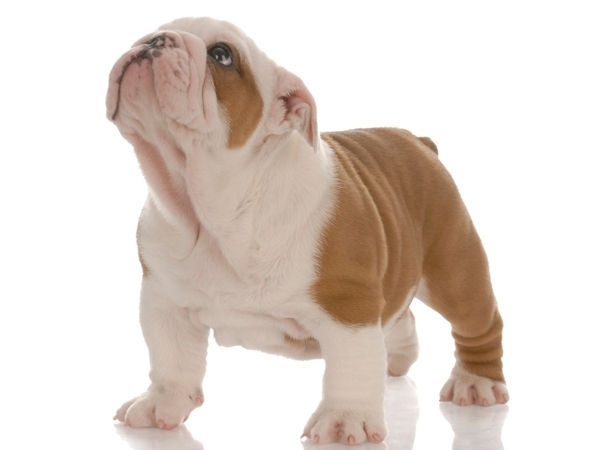 Over 80% of Bulldog litters are delivered by Caesarean section. The folds or "rope" on a Bulldog's face should be cleaned daily to avoid unwanted infections caused by moisture accumulation. Also, some Bulldogs' naturally curling tails can be so tight to the body as to require regular cleaning and a bit of ointment. Bulldogs are very sensitive to heat. Extra caution should be practiced in warmer climates and during summer months. Bulldogs must be given plenty of shade and water, and must be kept out of standing heat. Air conditioning and good ventilation is required to keep them healthy and safe. Bulldogs actually do most of their sweating through the pads on their feet. You will notice Bulldogs really enjoy cool floors such as tile or cement. This helps keep them cool. Due to the airway obstruction problem Bulldogs may have, like all brachycephalic or "short-faced" breeds they can easily get overheated and even die from hyperthermia. They can be big snorters and heavy breathers due to this obstruction, and by and large they tend to be loud snorers. These are all issues that are easy to keep under control as long as you stay aware and protect your Bulldog from these unsafe conditions. The term "Bulldog" was first mentioned in literature around 1500, the oldest spelling of the word being Bondogge and Bolddogge. The first reference to the word with the modern spelling is dated 1631 or 1632 in a letter by a man named Preswick Eaton where he writes: "procuer mee two good Bulldogs, and let them be sent by ye first shipp". The name "bull" was applied because of the dog's use in the sport of bull baiting. The name “Bulldog” is also translated as “bull dog” and is connected with the main purpose – to attack the bull. In ancient documents that have survived to modern times, the authors argue that the Bulldogs, as well as other breeds, far gone from its original form, are difficult to breed: females are not too susceptible, and males often suffer failure on the love front. Despite the slow formation and the fact that growing up is rarely achieved by a half years, their life is short and to the five-six years of age they are starting to show signs of aging. The original Bulldog had to be very ferocious and so savage and courageous as to be almost insensitive to pain. In 1835 dog fighting as a sport became illegal in circuses. Therefore, the Old English Bulldog had outlived his usefulness in England and his days were numbered. However, emigrants did have a use for such dogs in the New World. In the 17th century, Bulldogs were used for bull baiting (as well as bear baiting)—a gambling sport popular in the 17th century with wagers laid while trained Bulldogs leapt at a bull lashed to a post. The Bulldog's typical means of attack included latching onto the animal's snout and attempting to suffocate it. However, the Bulldog's early role was not limited to sport. In mid-17th century New York, Bulldogs were used as a part of a city-wide round-up effort led by governor Richard Nicolls. Because cornering and leading wild bulls was dangerous, Bulldogs were trained to seize a bull by its nose long enough for a rope to be secured around its neck. The use of dogs for fighting with other dogs or other animals was banned in the United Kingdom by the Cruelty to Animals Act 1835, but Bulldogs as pets were continually promoted by dog dealer Bill George. In time, the original old English Bulldog was crossed with the pug. The outcome was a shorter, wider dog with a brachycephalic skull. Though today's Bulldog looks tough, he cannot perform the job he was originally created for, as he cannot withstand the rigors of running and being thrown from a bull, and cannot grip with such a short muzzle.